When you’re staying in someoneelse’s home, you can never be sure how the oven works, but this turned out a treat. 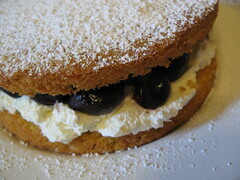 Delicious Victoria Sandwich filled with cream and a tin of John West’s finest cherries. Made to celebrate Coco’s Grandad’s birthday.